“Steel and concrete are detrimental to the environment, whereas wood is the material of the future,” said Sean McTaggart, Philly native and current architect at Hickok Cole in Washington DC. His group recently entered the Skyhive Skyscraper’s Challenge—a competition that asks entrants to design a creative and innovative hypothetical skyscraper—with their proposal for a mass timber structure at the site of Comcast’s rumored third tower. 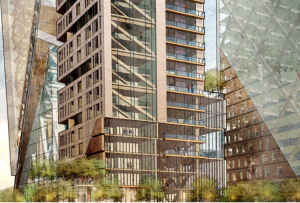 Their design envisioned a 62-storey structure, which would see two timber office towers connected by a bridge, with a third tower that would contain residential and retail spaces.